Tyler Powell chipping onto the 8th green at Kentucky Dam last week, led the Marshals with a 1-under 35 Tuesday. 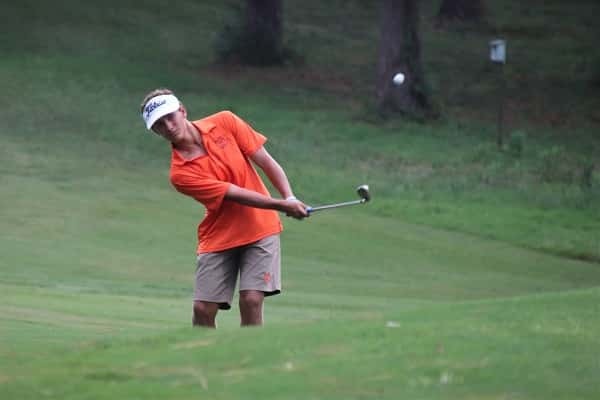 The Marshals played host to Mayfield Monday at Benton Country Club. The Marshals won the contest with a team score of 160 to Mayfield’s 166. Tyler Powell was the individual medalist shooting 35 (1 under par). Mayfield was led by Andrew Watson and Garrett Seay, both shooting rounds of 40. Next up, the Marshals will travel to Lexington to play in the Lexington Dunbar Classic at Kearney Hill golf course on Saturday.